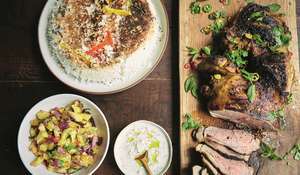 An inviting kefta mkaouara recipe from Rick Stein. 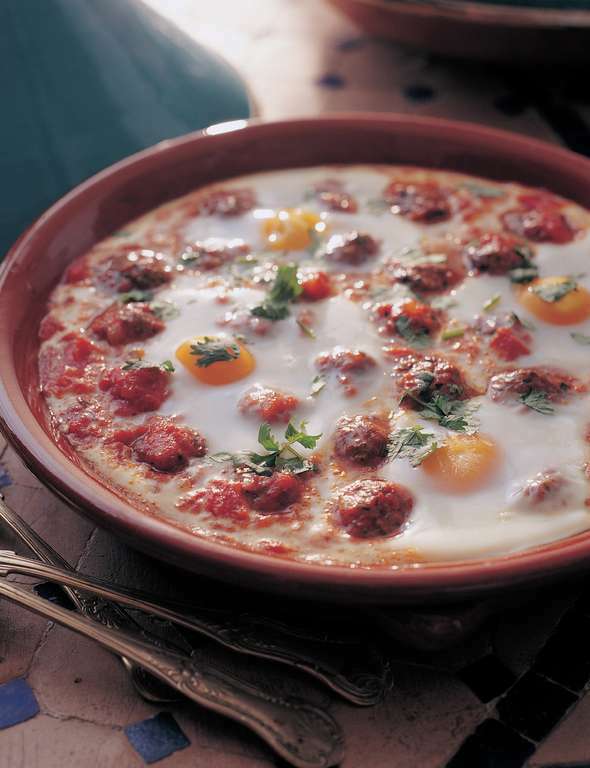 The Moroccan style spicy meatball, egg and tomato tagine also works really well with sauteed king prawns. Chefchaouen is a town of surreal blue. It’s about a 45-minute drive from the Mediterranean coast and is an absolute must if you’re in Tangiers for a few days. 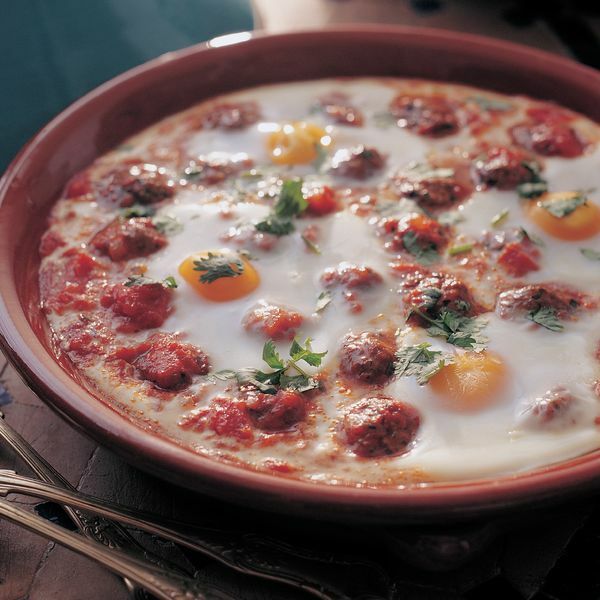 This is a simple dish of onions, tomatoes, cumin and paprika baked with spicy little meatballs and eggs. Sometimes, when I visit somewhere particularly special, I think about how much people that I love would love it, and the colour and bustle of Chefchaouen would be absolutely fascinating to my Australian partner, Sarah, but even more so to her young children Zach and Olivia. Olivia is rather fond of eggs, as is her brother, but some days she tells me, ‘It’s not an egg day.’ I think every day would be an egg day in Chefchaouen. 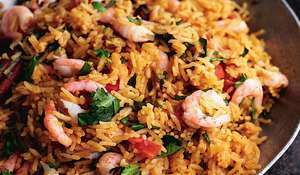 You can also do a lovely variation of this dish using sauteed peeled raw prawns instead of meatballs, stirred into the sauce and briefly baked without the eggs. 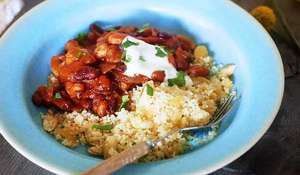 Whichever version you make, serve with warm flatbread. Preheat the oven to 200°C/Gas Mark 6. For the meatballs, put the minced beef, parsley, cumin, paprika, 1 teaspoon salt and some freshly ground black pepper into a bowl and mix together well using your hands. Dampen your hands and form the mixture into about 28 2.5-cm balls. Heat 2 tablespoons of the oil in a shallow tagine or frying pan and brown the meatballs briefly on all sides. 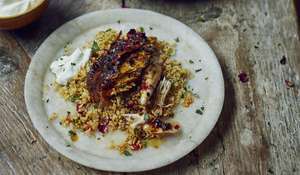 Remove with a slotted spoon to a plate and set to one side. Add the onion for the sauce to the pan with the remaining tablespoon of oil and cook gently for 10 minutes until very soft and just beginning to brown. 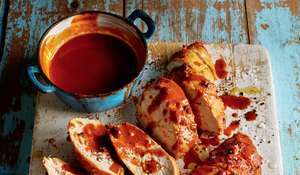 Add the remaining sauce ingredients and leave to simmer gently for 15-20 minutes until well concentrated in flavour but not too thick. Season well with salt to taste. Return the meatballs to the sauce and mix together. 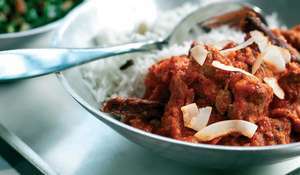 Transfer to a shallow ovenproof dish if you have prepared the sauce in a frying pan, otherwise leave the mixture in the tagine. Make 4 slight dips in the mixture and break an egg into each one. Bake in the oven for 15 minutes or until the eggs are just set. Scatter with the chopped coriander and serve. 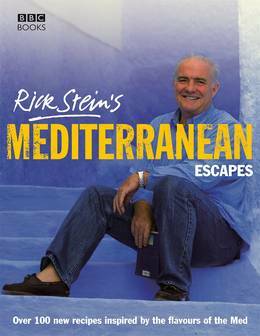 From Britain's favourite TV chef, an amazing cookbook exploring the many and varied cuisines of the Med.